This attraction was not the first on our list, but was on our spreadsheet of "filler" ideas. After a few of our primary attractions fell through for the day (closed for maintenance, etc. ), we decided to head out into the cornfields of Dyersville. This was Iowa, anyway. As we were approaching, Kristy read the literature and shared the following: The field spans two pieces of property, and therefore, both landowners have responsibilities and rights to it. There are two parallel access roads leading to side-by-side parking areas and gift shops, one belonging to each landowner. The shops hold the same kitschy souvenirs. The only difference is that one closes at sunset and the other is open late. 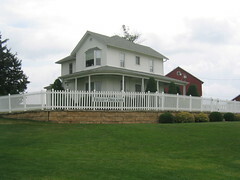 We arrived on the side that has the farmhouse and most of the infield. Signs were posted everywhere noting that the landowner near third base had sold out to out-of-state developers and that souvenirs purchased in that gift shop wouldn't go to Iowa farmers. However, the gift shop we chose was supporting this Iowa family of farmers. The little "tiffs" like this that we see on the road are always a source of amusement. The mirror image roads, parking lots, and gift shops were classic roadside Americana. We wandered out to the baseball diamond where there were fanatics hitting a few balls. 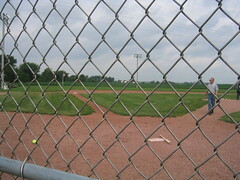 The outfield was ringed by cornfields, just like in the movie. We talked to one of the employees who said they had wanted the corn to be shoulder-high for the purposes of the movie. . . Of course, the year they filmed it, Iowa had one of the worst draughts in years, jeopardizing the movie set, so they went to work with some serious irrigation systems. Of course, this caused the corn to grow too high, so the actors actually had to walk on wooden platforms set up in the corn so that it would be shoulder high. We checked out the souvenirs and headed back to the car, taking a short break to call our husbands. Their reactions were identical: "You're at the Field of Dreams??" "THE Field of Dreams??" "Are you serious?" "Were there people playing baseball??" "Did you play baseball???????" Must be a guy thing.